Promote your company, product or service with the perfect 2-in-1 promotional piece. 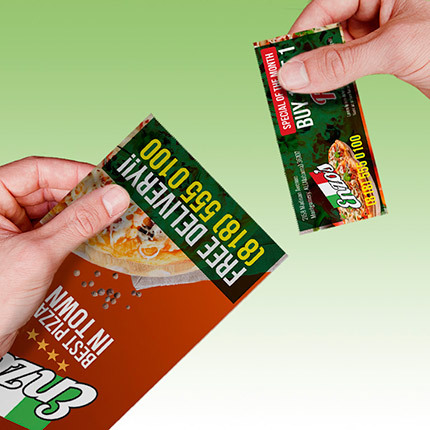 Tear-Off Cards allow you to print in the postcard area while using the perforated tear-off portion below for business or membership cards, coupons, etc. Featuring 1 straight perforation 2 inches from the bottom edge, the multi-functionality of these allows for virtually endless possibilities! 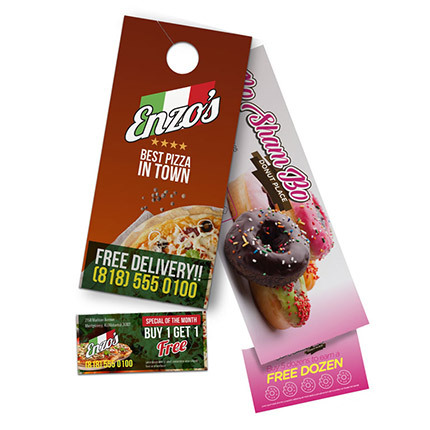 Take your promotions door-to-door with Tear-Off Door Hangers. With the same 2-in-1 benefits as Tear-Off Cards and a clean die-cut hole at the top for door hanging, they’re the ultimate THREE-in-1 promotional piece! Note: Our standard tear-off cards include 1 straight perforation 2 inches from the bottom edge.